Protected Land, Healthy Water, Happy Fish…. Each year Wisconsin’s Northern Pike begin an annual migration to reach their spawning grounds in temporary shallow wetlands. This fascinating pilgrimage is not new, but the challenges pike face along the way certainly are. 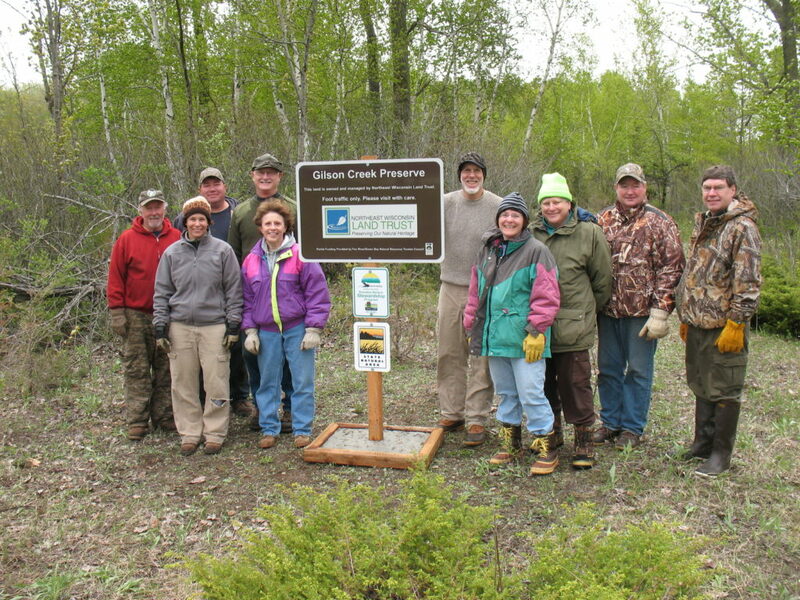 Our partners at Northeast Wisconsin Land Trust are helping pike get to prime spawning areas as wetlands are drained and converted to other uses. As wetlands are being drained and converted for other uses and streams are bisected by road crossings–sometimes blocking this migration–Northeast Wisconsin Land Trust (NEWLT) is ensuring that these amazing creatures reach their spawning grounds. Last year, NEWLT purchased 34 acres of ephemeral wetland property along Green Bay’s west shore that plays a critical role in the area’s pike migration. Now when adult pike leave the waters of Green Bay, they swim up these and other tributary streams to find places to lay and fertilize eggs. Once hatched, pike fry also spend time in these wetlands growing strong before beginning their journey back to Green Bay. Pike spawning is a short-lived, almost magical, event to witness. This new preserve is now open to the public and thanks to NEWLT and partners that include The Nature Conservancy, public agencies, foundations, and local residents, we can all enjoy the magic of pike spawning–and the benefits it provides our communities– for years to come. This fish tale is just one of the inspiring stories that will be featured in our Fall edition of our newsletter, Crosscurrents, highlighting the important work land trusts are doing throughout the state, fulfilling needs and enriching their communities! Keep your eyes open for the newsletter, coming this November. Last week, the Northeast Wisconsin Land Trust held a dedication ceremony to open a floating platform in their 48 acre Guckenberg-Sturm Preserve. 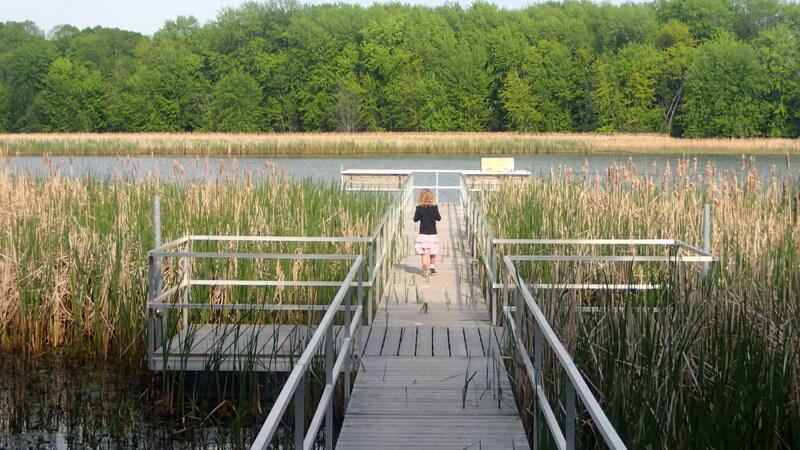 The Preserve is situated along the west shore of Little Lake Butte des Morts and bordered on the north by Mud Creek at the point of its convergence with the Fox River as it travels northeast into Lake Michigan’s largest bay, Green Bay. This new platform will allow Fox City residents and visitors to venture into the marsh all the way from the upper flood plain to the water’s edge. The ability of the platform to float makes this area accessible from March through May when the annual spring floods come in as well as at other times when the water level is lower. This wetland is home to a variety of wildlife. In the fall one can see thousands of Canadian Geese coming and going as well as otters gliding through the waters. In the summer one might see hundreds of ducks or handfuls of White Pelicans in the water. This area has always been an important preserve, and now people can really explore and experience what this 48 acres has to offer. Not only is the Guckenberg-Sturm Preserve a beautiful scenescape, it is also an important area for health reasons as well. In a 2005 Clean Water Testing Report, it was concluded that this “marsh is a healthy, highly functioning filter for the Fox Valley’s soil and water cycle”. Because the Fox River Valley is one of Wisconsin’s most urbanized and industrialized areas, it is important that this wetland maintain its health in addition to its beauty. You can visit this beautiful spot! Find out more at Northeast Wisconsin Land Trust’s website. Although our mission is clearly focused on Wisconsin conservation, we often find that our work here is strengthened by working with partners at the regional and even national levels. One such example is our partnership with the Blufflands Alliance – a group of Wisconsin, Minnesota, Illinois, and Iowa land trusts working together to preserve the blufflands of the Mississippi River. We were present at their quarterly meeting in Galena, IL to explore how working together increases our collective capacity to protect more land in the blufflands. At GWC we’re lucky to have an exemplary, committed board of directors that is always striving to advance our mission using their unique skills and connections. One such director is Randall Lawton, from De Pere, who has stated that his goal during his service on our board is to increase support for private land conservation in northeast Wisconsin. In an effort to do just that, he hosted a breakfast reception in Green Bay to introduce his friends and colleagues to GWC and NEWLT. In attendance were representatives from the local media, business owners, elected officials, and community leaders — all of whom now know more about their local land trust and how we’re working together to protect the special places in northeast Wisconsin. Throwing out the First Pitch! GWC had the unique opportunity to be the featured nonprofit at a Madison Mallards game – the popular summer collegiate baseball team. Not only did we introduce GWC and Wisconsin land trusts to ~1,000 new people, but we also got to throw out the first pitch! The six year old daughter of GWC Executive Director Mike Strigel throws out the first pitch. The Northwoods Land Trusts’ annual meeting was held over the weekend at Minocqua Winter Park – the site of the largest ever conservation easement donated to a Wisconsin land trust. GWC was in attendance to show our support for the land trust and its record-breaking work, as well as to meet with their staff and board to discuss our upcoming work to help NWLT prepare for Land Trust Accreditation. A central component of our Land Trust Excellence & Advancement Program (LEAP) is working one-on-one with land trusts to assess how they meet Land Trust Standards & Practices, the legal and technical guidelines that guide land trust work. This week our Land Trust Program Director, along with her counterpart from the Midwest office of the Land Trust Alliance, visited with the staff and board of Tall Pines Conservancy to guide their assessment session. Next, they’ll deliver a set of recommendations and provide support to assist Tall Pines with fully implementing Land Trust Standards & Practices. And we’re already looking forward to what next week holds! Spring seems to have officially sprung! All signs of winter have disappeared quickly and haven’t shown any hint of returning. The quickly melting snow and ice have allowed Northern Pike to begin spawning early this year. There have already been sightings of these fish in streams along Northeast Wisconsin Land Trust’s newly completed preserve of 34 acres of wetlands along the West shore of Green Bay. This preserved area is an important spawning location for the Northern Pike. The fish use the network of streams in the preserved area to travel inland from the Bay each year to spawn. Once the new fish hatch they return to the Bay and the streams once used as their travel routes dry up. “If we care about the waters of the Bay and the quality of our fisheries, land conservation on the west shore of Green Bay is crucial. The health of Green Bay and also Lake Michigan is very much determined by what we do on the land here, in northeastern Wisconsin,” said Deborah Nett, Executive Director of NEWLT. This area should be open to the public late this summer. More information on recreational opportunities in northeast Wisconsin can be found by contacting Northeast Wisconsin Land Trust. We’re Packing Our Bags for Rally 2011! At last count over 25 Wisconsin land trusts have registered for Rally in October. We’re really excited that so many of our member land trusts are seizing this excellent opportunity to learn from each other and the national faculty that make it all possible. All told, at least 17 Wisconsin land trusts are receiving some well-deserved assistance with Rally costs. Thanks go to the generous donors who make LEAP possible. We can’t wait to see each of these Wisconsin land trusts and more at Rally in Milwaukee on October 13-16. You’ll have endless opportunities to learn in workshops, get outside together, share with colleagues, and hear some pretty spectacular plenary speakers including Milwaukee’s own Will Allen while we’re there. If you haven’t already, here’s your chance to register. We promise you’ll get your money’s worth and feel reminded of why we love our important work.